Then investigated the relationship between sequencing depth and total molecule count per sample. 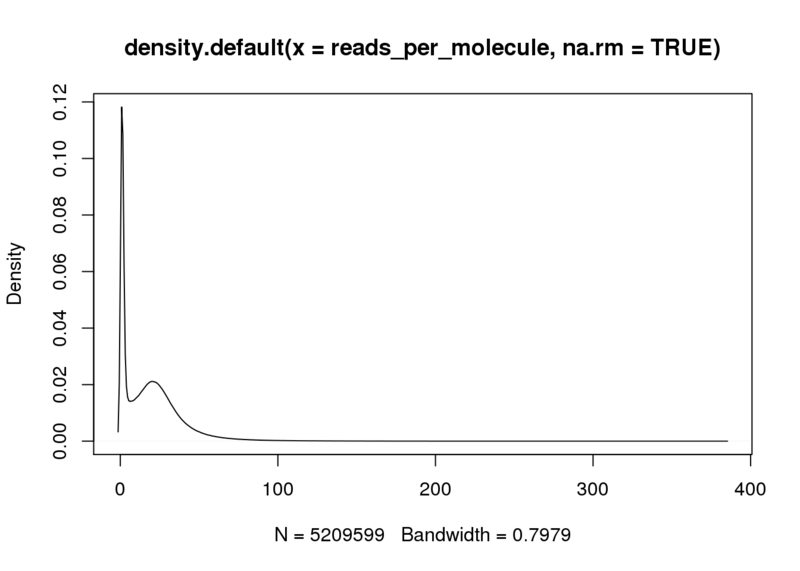 Found that sequencing depth affects the total molecule count, which in turn affects PC1. 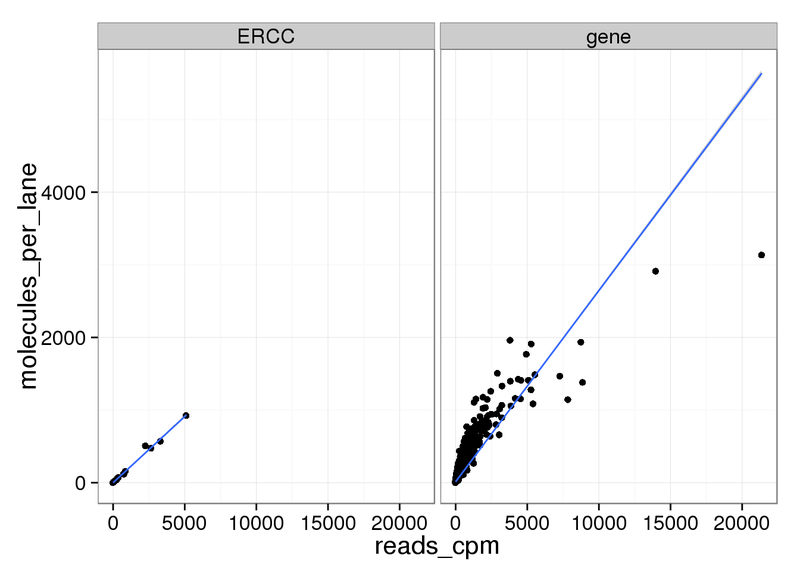 Will use TMM-normalize molecule counts per million mapped (cpm) for downstream analyses. 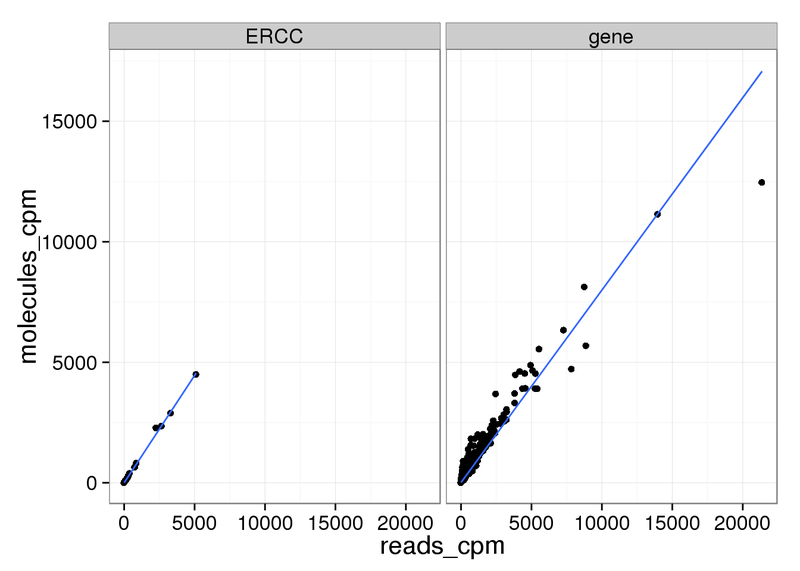 Therefore reran the original comparisons between reads and molecules, but this time using TMM-normalized counts per million for the molecules similar to the reads. 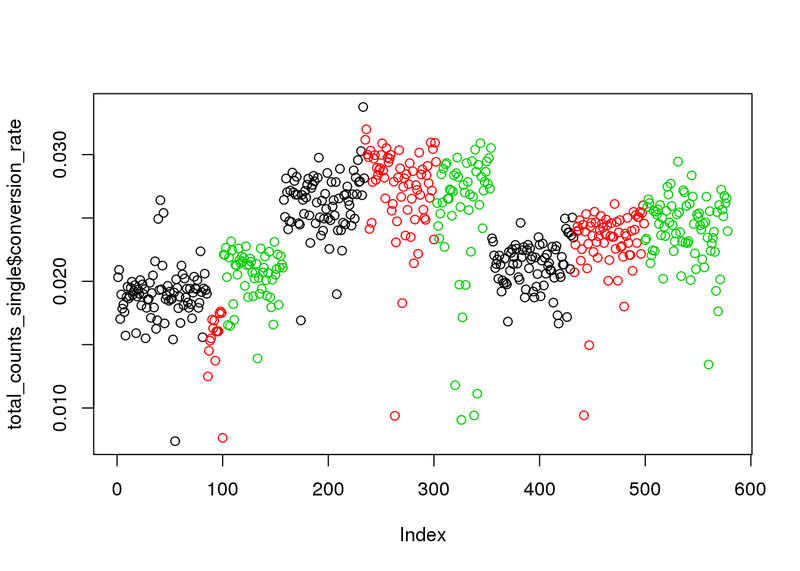 The correlation of the mean expression improved. 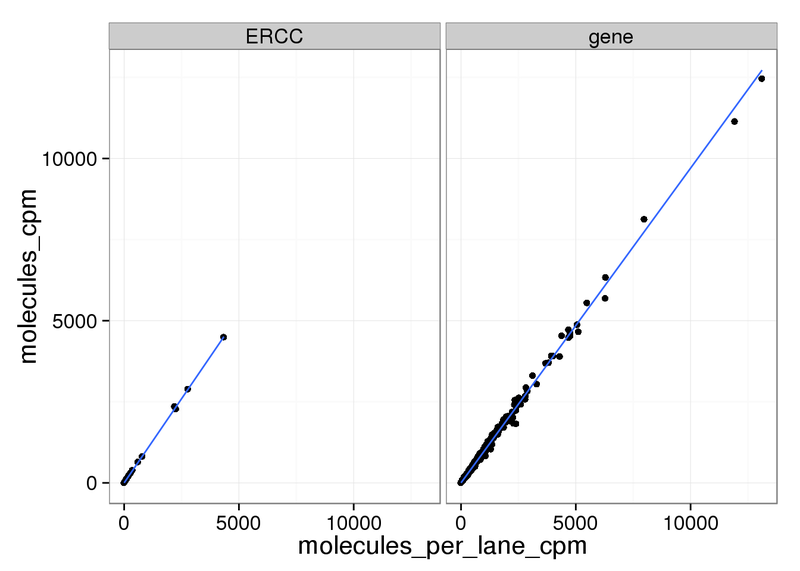 Input molecule counts summed across lanes. 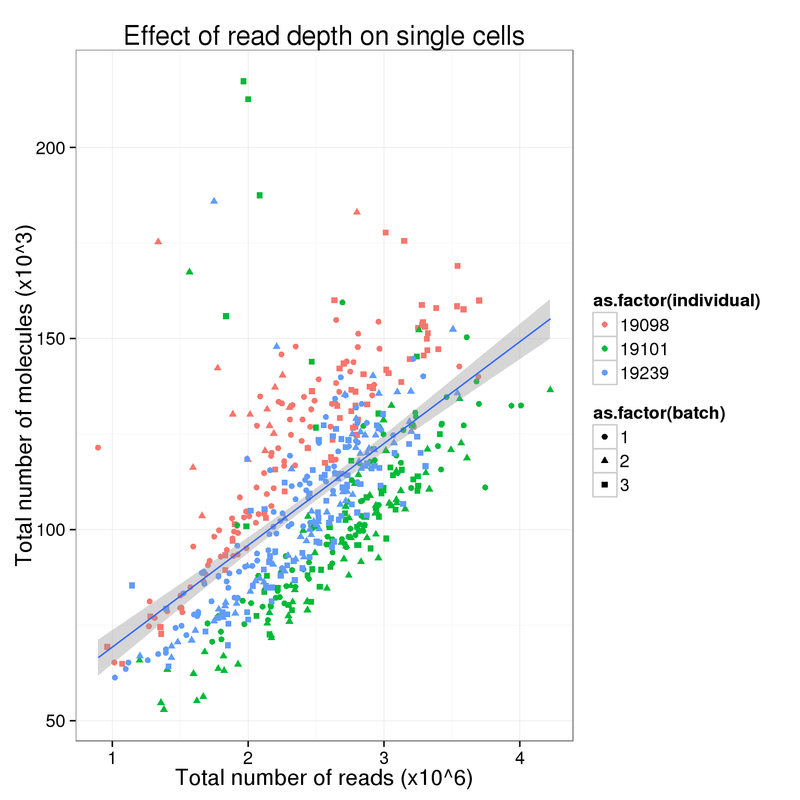 Remove genes with zero read or molecule counts in the single cell or bulk samples. 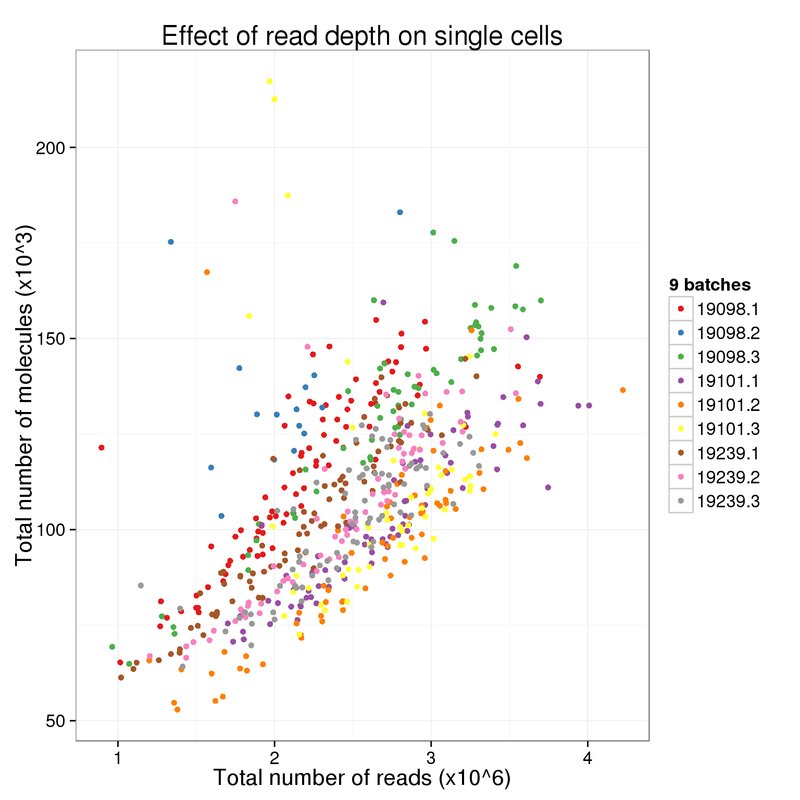 Calculate the number of reads per molecule of each gene in each cell. And for the molecules summed per lane. All three are highly correlated. 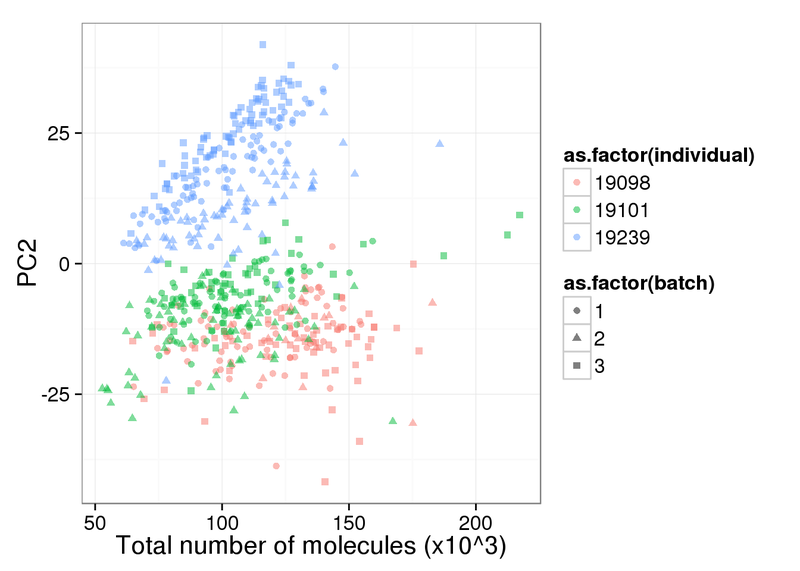 There are only a few genes with molecule counts greater than the number of UMIs. They are highly expressed mitochondrial genes. 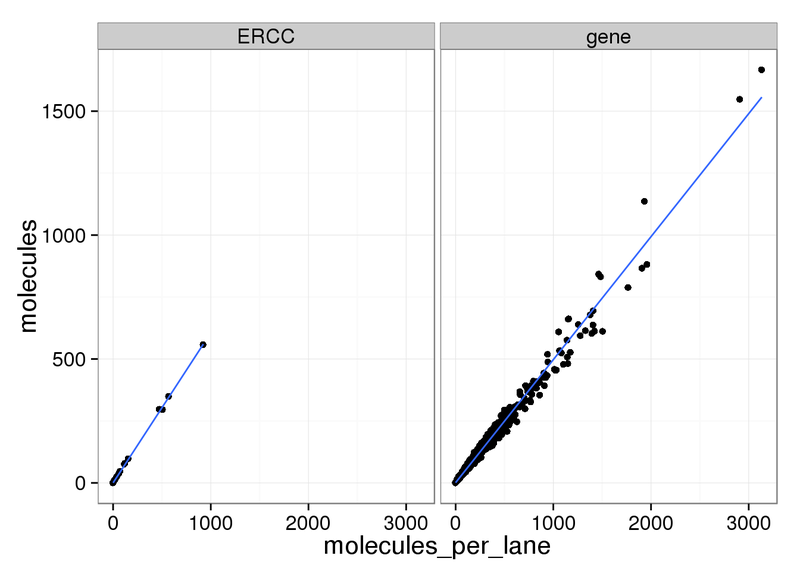 The molecule counts and the molecule counts summed per sequencing lane are highly correlated. 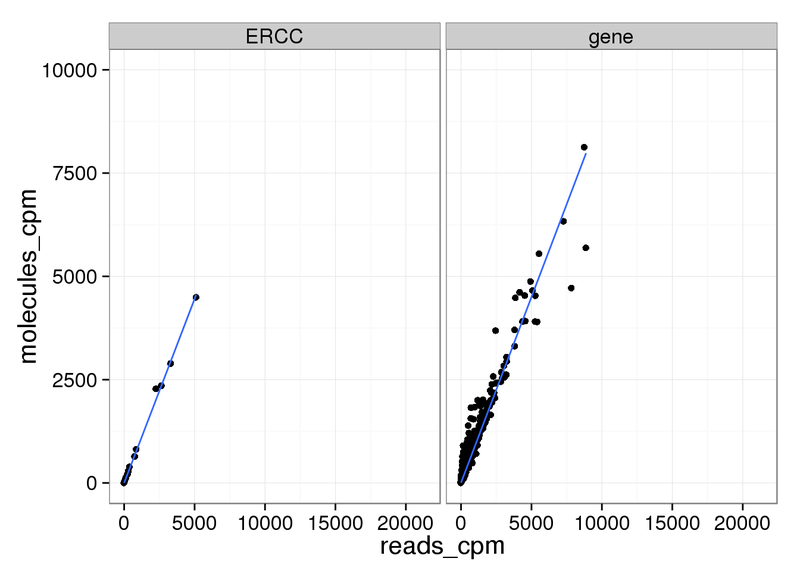 This indicates that most of the bias is introduced in the library preparation step and not during sequencing. 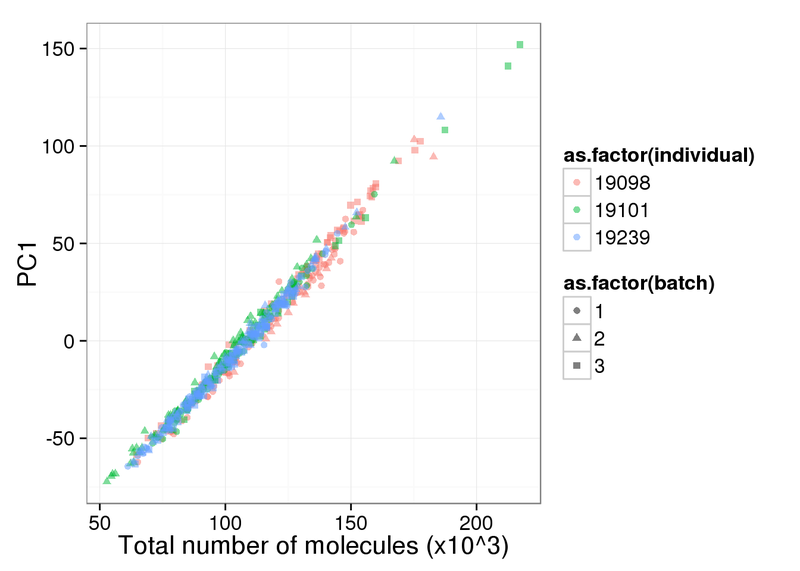 How dependent are the molecule counts on the total molecule count for a given sample? Should we standardize by the total molecule count per sample? Islam et al. 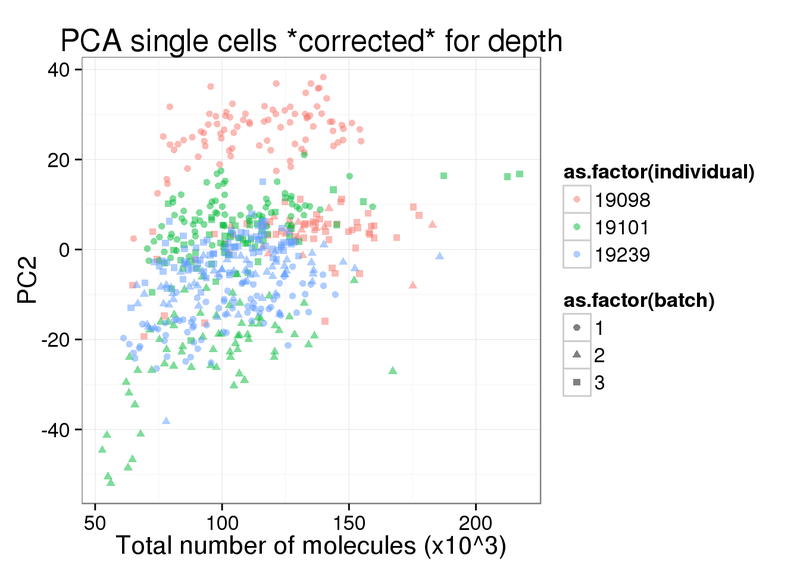 2014 argue that this is not necessary, “scales for molecule-counting scatterplots (Fig. 2d,e) are absolute and would not change appreciably if the number of reads were increased.” Let’s check this assumption. 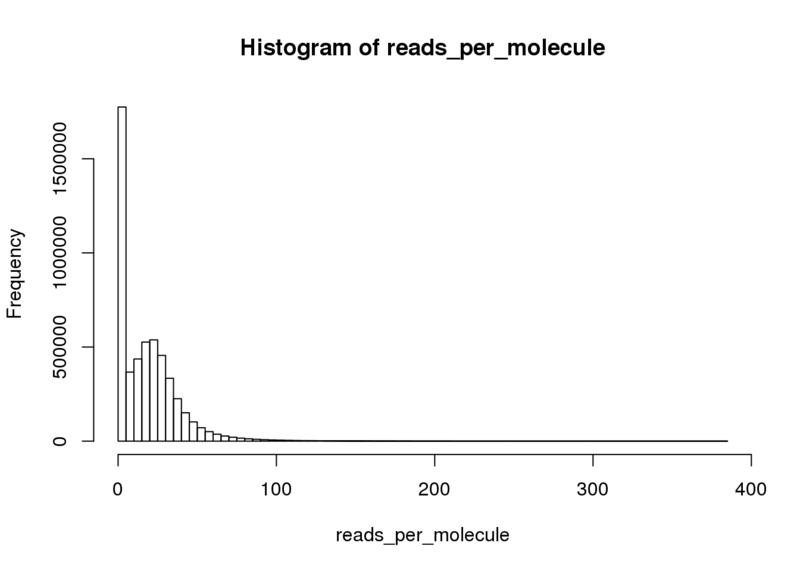 Does the total number of molecules per sample vary with the total number of reads? 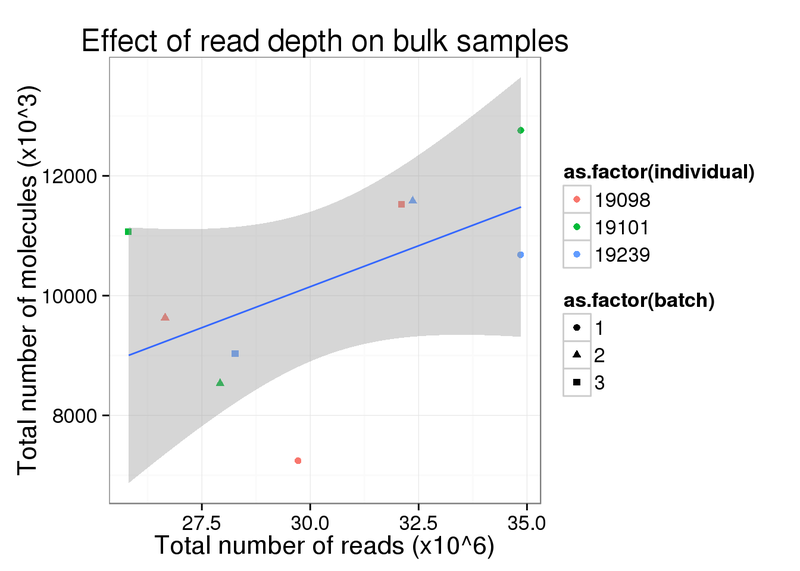 If it is not necessary to standardize the molecule counts, the molecule counts should be consistent across varying read depths. So this is clearly not the case. 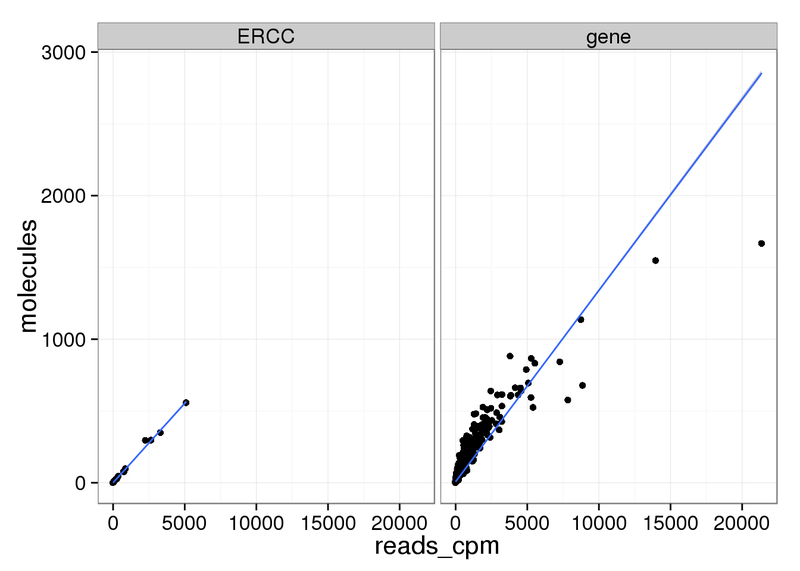 Perhaps in the ideal case where all the cells are sequenced to saturation, then any increasing sequencing would not make a difference in the molecule counts. 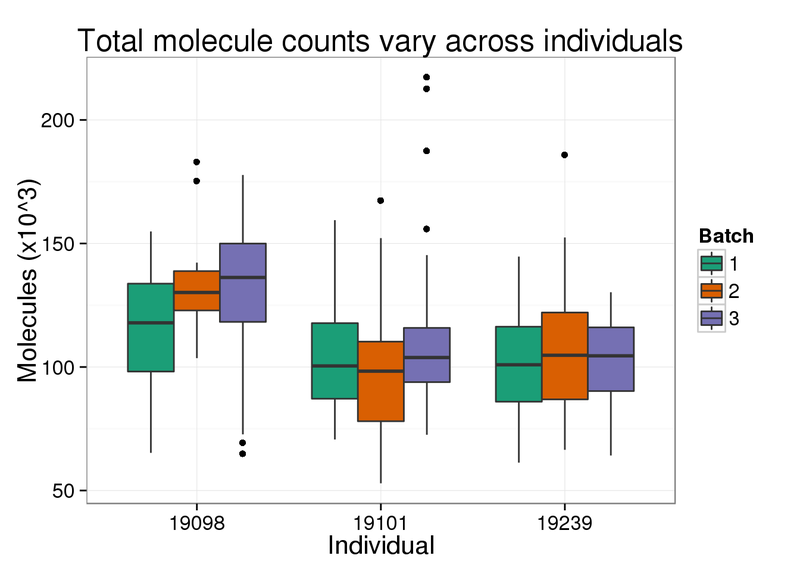 Also, there is a difference in total molecule count between the three individuals. 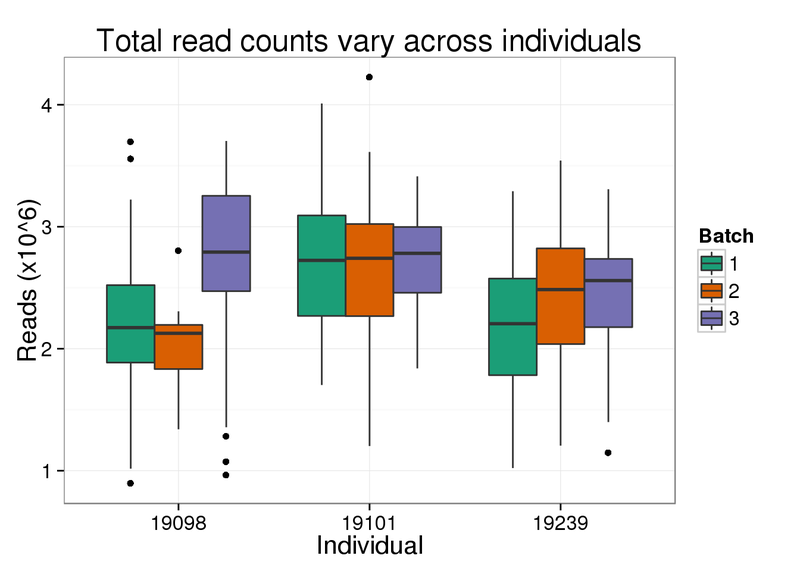 But not for the total number of reads, as expected from the plot above of the effect of read depth where all three individuals span the x-axis of the total number of reads. There is a clear difference between individuals. 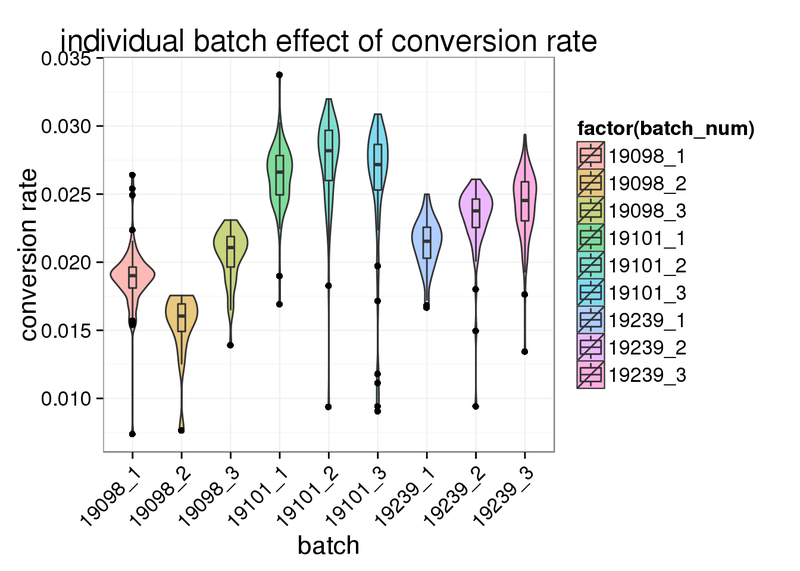 Is there a difference between the full 9 batches? It is diffcult to see when all 9 are plotted at once. 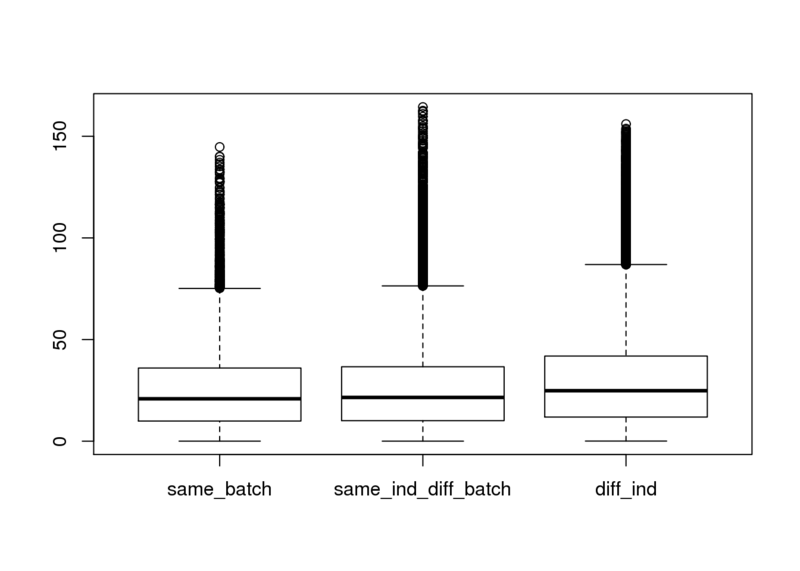 Here are the batches split by individual. 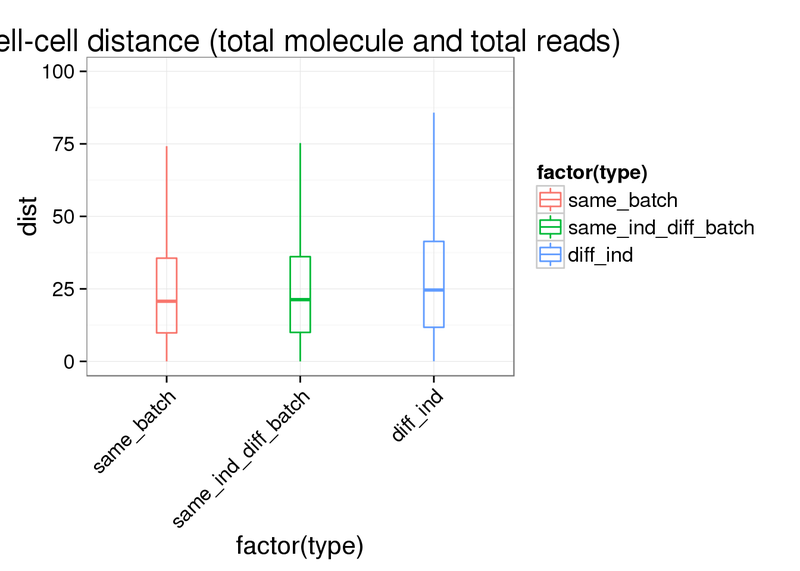 Pairwise distance in (total reads, total molecules) between batches or individuals. 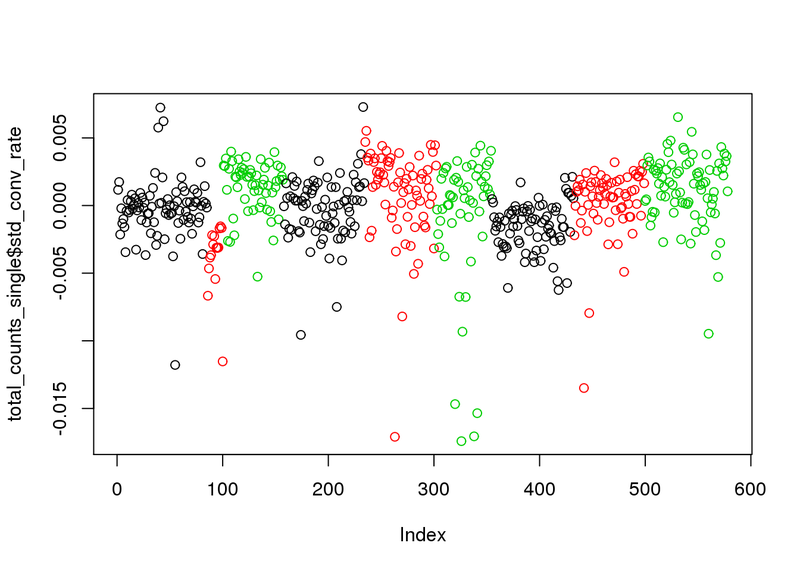 Compute pairwise Euclidean distance between cells. 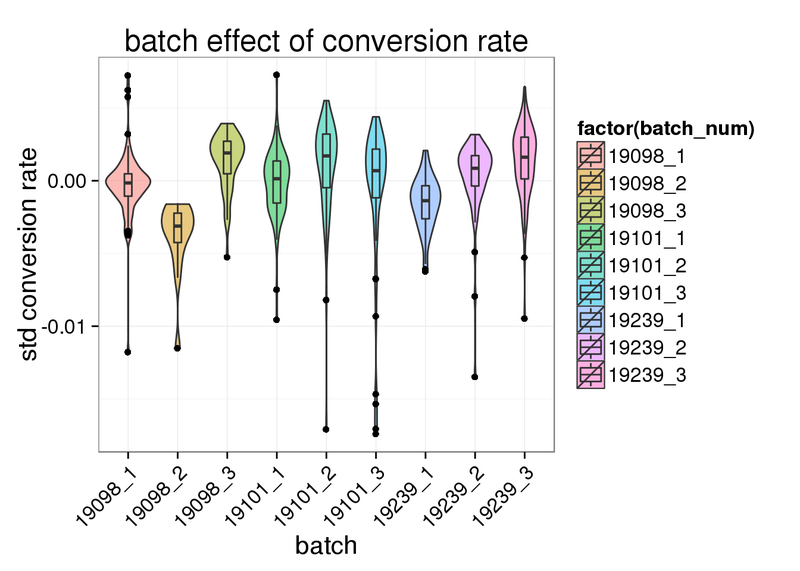 dist_index_matrix[same_ind_index & !same_batch_index] <- "same_ind_diff_batch"
Warning: Removed 1285 rows containing non-finite values (stat_boxplot). Warning: Removed 292 rows containing missing values (geom_point). Warning: Removed 613 rows containing missing values (geom_point). Warning: Removed 1195 rows containing missing values (geom_point). What effect does this difference in total molecule count have in PCA? 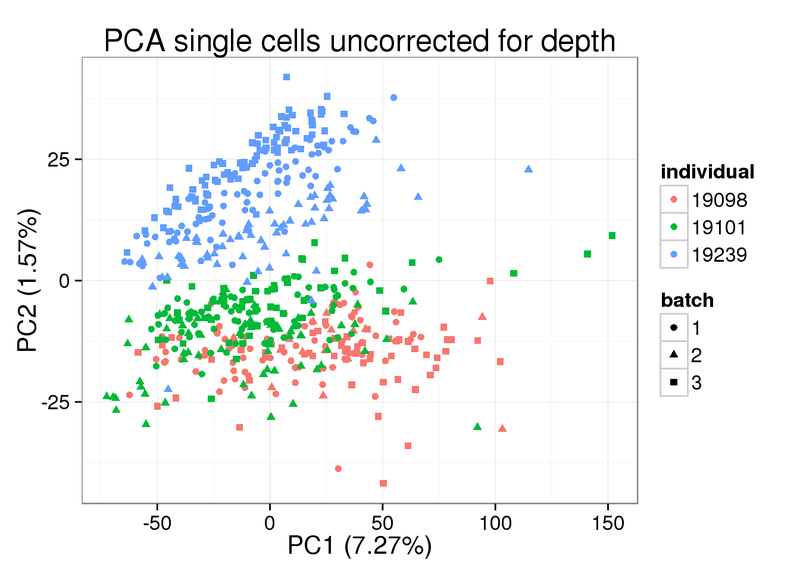 The total molecule depth per sample is highly correlated with PC1. However, it did not affect PC2, which captures the individual effect. 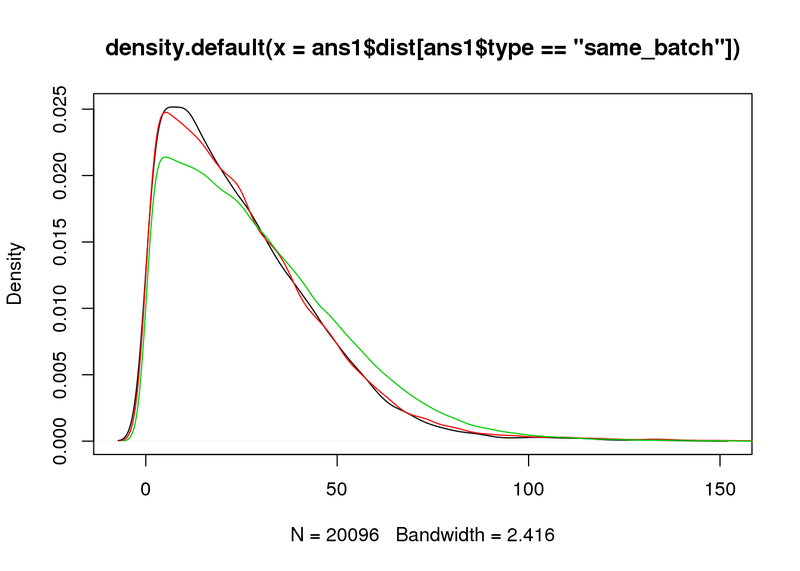 What happens to the PCA results when depth is properly accounted for using TMM-normalized counts per million? 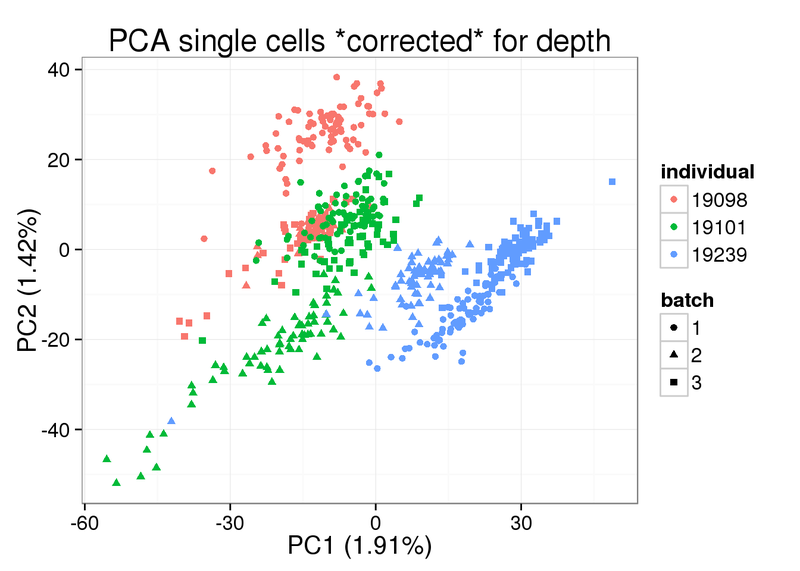 PC1 is no longer associated with sequencing depth! 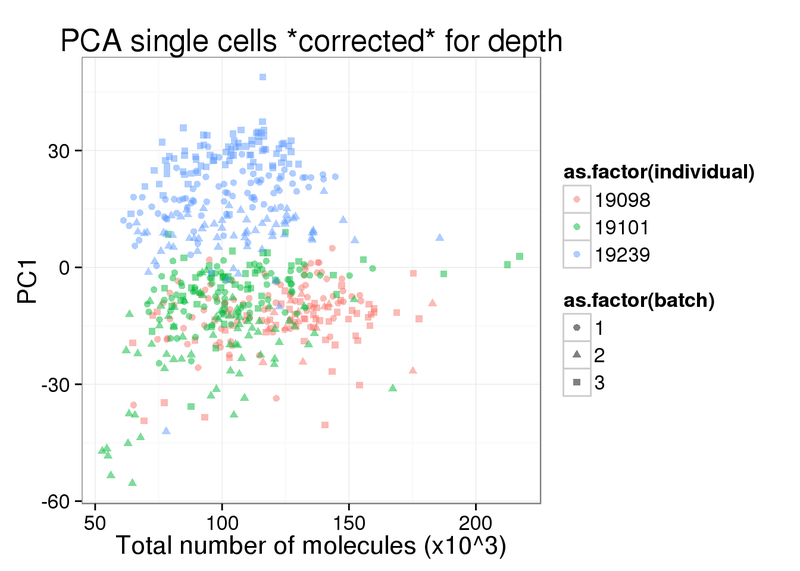 This time standardize the molecule counts for the sequencing depth. 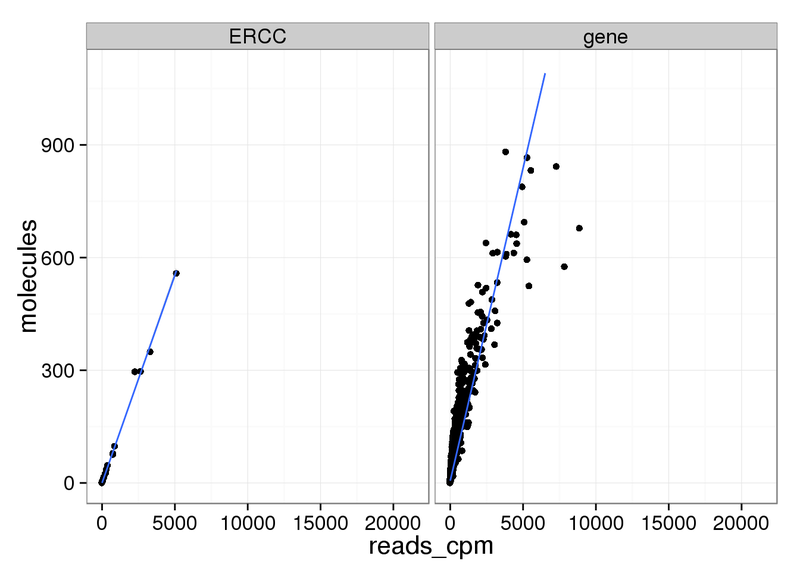 All three are even more highly correlated now that the molecules are standardized. 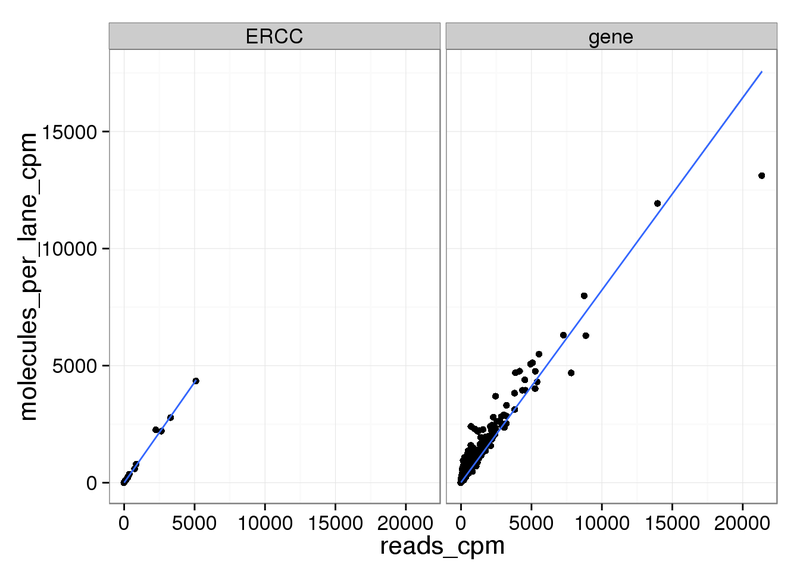 And as above, the molecule counts and the molecule counts summed per sequencing lane are highly correlated, which indicates that most of the bias is introduced in the library preparation step and not during sequencing.